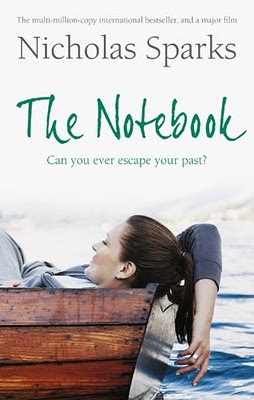 'The Notebook' by Nicholas Sparks is a simple yet heart rendering love story. It will make you smile and cry often. It is about the belief that true love never dies or dims, it remains with you through the thick and thins of life. I will definitely recommend reading it. The story starts with eighty years Noah Calhoun reading out his 'Notebook' to a lady who does not remember him, in a nursing home. It is the story of his life, his love story. He does it every day, in the hope that it with stir her memory and she will remember things from the past which she seldom does these days with only a few exceptions! As he reads out his notebook, the story flashes back to his past to October 1946. It is the time when he had recently returned from war to North Carolina. To keep himself busy and to forget the adversities of war he spends all his time restoring an old plantation house, which he has recently purchased to its old glory. Despite his best efforts, his memory often slips to a time when he had met Allie, her love, fifteen years ago. He has never been able to forget her, the summer they had spent together. He has finally learnt to content himself with the memories and thinks that he would never be able to find her. And suddenly one day she turns up! Allie is engaged to another man, Lon Hammond-A well know man and their marriage is just three weeks away. But she realises that the memories of her long lost love has never dimmed all these years and that is what makes her go back and meet him one last time. Things that followed the meeting changes their lives. The story does not end there, in fact it is quite the beginning of their beautiful love story. The ending is not exactly a happy or a sad one but a mixture of the too which will make you smile and cry at the same time. True love is eternal but some times memories fade away, because there is always something that is not in our hand, some circumstances in life we can't change or avoid. The love described in the story is profound. It is poignant love story that will move you deeply. "I am nothing special; of this I am sure. I am a common man with common thoughts and I have led a common life. There are no monuments dedicated to me and my name will soon be forgotten, but I've loved another with all my heart and soul, and to me,this has always been enough." havent read any spark novels yet.Have seen message in a bottle and liked it.. will pick this book sometime. Surely do! I am sure you will like it.. I have read this book and I like it. This is one of my favorite Nicholas Sparks books, if not the favorite. I love the quote you selected! I have this book but I haven't read it yet. I have heard that A walk to remember is better than this book. Have you read that?